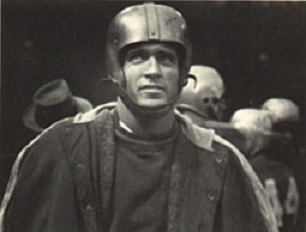 Box played football and basketball in a college career that was interrupted by military service during World War II. Chosen by the Washington Redskins in the 20th round of the 1948 NFL draft, he was traded to the Lions, who initially used him at halfback. Box caught 15 passes for 276 yards (18.4 avg.) and four touchdowns as a rookie in ’49. He was shifted to end in 1950 and in a game against the Colts caught 12 passes for 302 yards, one short of the then-NFL record and setting a club mark. Box ended up with 50 catches for 1009 yards and 11 touchdowns for the year and was selected to the Pro Bowl as well as receiving second-team All-NFL recognition from the Associated Press. What he lacked in finesse, he made up for with his speed. Box missed all of the 1951 season as he returned to the military during the Korean War. Lions went 9-3 to tie for first in the NFL National Conference while ranking second in both touchdowns (43) and scoring (344 points). Won National Conference playoff over Los Angeles Rams (31-21) and NFL Championship over Cleveland Browns (17-7). Box was bothered by injuries in 1953 and caught 16 passes for 403 yards and a 25.2-yard average gain that included a 97-yard TD reception. He retired following an injury-plagued 1954 season, having caught 129 passes for 2665 yards (20.7 avg.) and 32 touchdowns. In a short but productive career, he received first- or second-team All-NFL honors twice and was selected to two Pro Bowls. Box went on to become wealthy in the oil business, and while he often generated controversy with his methods, he also donated more than $1 million to a fund to assist former NFL players in need.